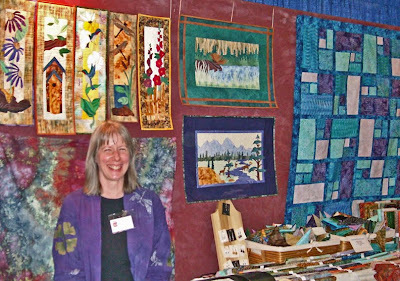 For years now, we've looked forward to seeing Suzi Soderlund at our local quilt shows. 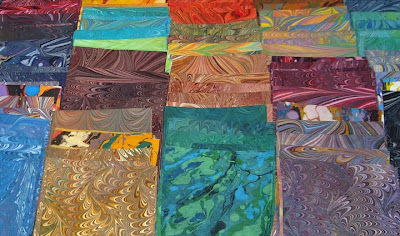 Her hand-marbled cotton fabrics are luscious - each one a treasure. 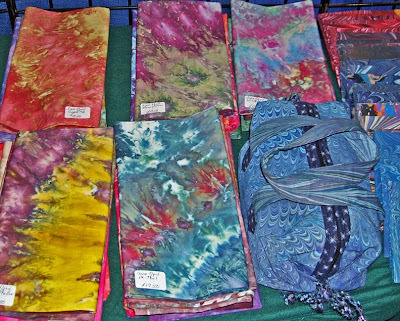 Mom and I always pick out a few pieces of fabric, dreaming of butterfly wings, rolling seas and dramatic flowers. Although it's nearly impossible to pick a favorite, I'm always drawn to her rosey-browns, purples and greens. Mom heads straight for the teals, blues and yellows. Just look at these gorgeous colors! Someday, I may even have a project special enough to warrant cutting into one of these masterpieces. Like with vintage ephemera and photographs, I just can't quite bring myself to use them... they provide so much joy and inspiration just as they are! However, here are a couple of Suzi's examples of how to actually use her fabrics ! The newest addition to her collection this year is amazing Snow-Marbled fabric. And yes, she really uses snow as part of her process! Before their home was graced with its first snowfall of the year, her husband scouted out some snow and brought it back home to her in his pick-up truck. You've gotta' love these folks! 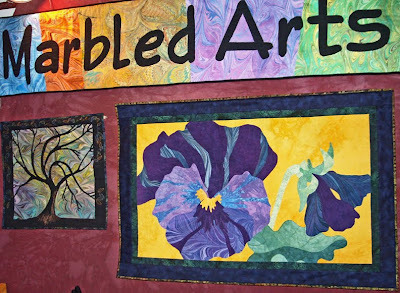 To find out more about Suzi and her passion for marbling, you can visit her blog and website. Gorgeous fabric. Does she ever cross the pond to sell? Wow! These are positively beautiful. WOW!